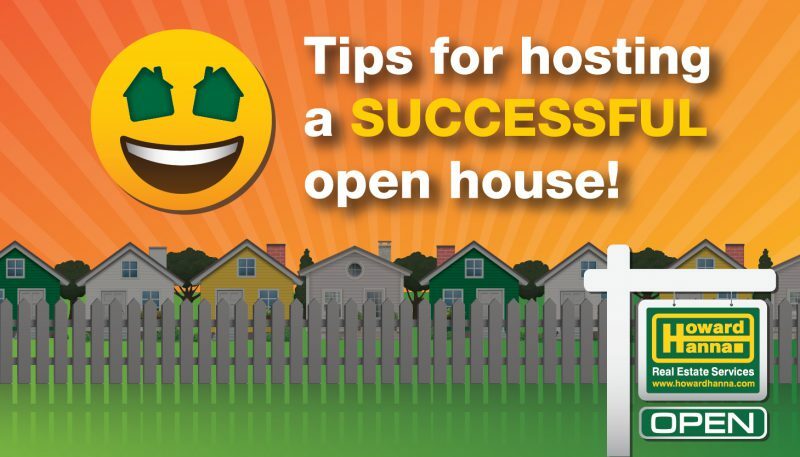 As Howard Hanna’s 2019 Big Even open house events approach, here are some tips for hosting a successful open house! Most buyers begin their home search online, so it’s increasingly important to advertise and promote your listings with a professional online presence. Captivate your audience where they spend most of their time – on the internet. Make sure your listing has open house info on HowardHanna.com. Don’t forget to promote through flyers, emails, invitations, phone calls, newspaper advertisements, yard signs, billboards, postcards, and word of mouth! Reach out to previous open house attendees and clients. The more you promote and advertise your open house, the more people will hear about it and visit. Tell your sphere to download the Howard Hanna Open Houses app to plan their open house weekend! Howard Hanna Open Houses Today helps your clients search for open houses on the go, or plan a house hunting weekend. If you are planning to use Open2Close to manage sign-ins at your open house, make sure you’re ready and that your device functions well and is charged. Have the app downloaded, make sure you’re signed in, and check that the details of your open house are correct. Neighbors are a great resource when hosting an open house. Apart from the sellers, the neighbors are usually the most informed about the area and could provide valuable insights. Your listing’s neighbors may also have people they want to move into the neighborhood and therefore may be great sources of leads for you. Invite the neighbors to attend the open house or, if time allows, have a special showing for neighbors to get their input. As the saying goes, there is no such thing as being too prepared. Make sure you prepare your listing for the open house. Have the home cleaned, free of clutter, and in its best condition. Arrive early and turn on all lights and open any drapes or curtains. Don’t forget your Howard Hanna lawn sign and directional signs! Prepare the sellers in advance for their open house: inform them of when the house will be open, what they need to do beforehand, like lawn care or snow removal, or if you want them there or away. Talk to them about features they wish for you to highlight and answer any questions they might have. Prepare yourself! Get your game face on, dress professionally, review the home, community, and local school facts, and get ready to answer questions from your attendees. Bring all necessary materials, like marketing materials, financial sheets, a sign-in sheet, property information sheets, agreements of sale, a calculator, listing and sales kits, numerous pens, and anything else you find useful. Familiarize yourself with other listings, including for sale by owner properties, in close proximity to have an understanding of the market and competition. Talk with your manager and ask for any tips or suggestions of things you might not have thought of. Establish your opening dialogue and remember to introduce yourself and the company, ask and remember their name, and encourage them to provide their information in Open2Close for a follow-up. Open2Close also helps verify contact information on the spot and provides social profiling information that can make it even easier to connect with potential buyers. Make sure you allow them to ask questions and offer feedback. If they’d like a guided tour through the home, pre-plan your route, ending right by your marketing and promotional materials. Have you seen any properties you liked? If they say no, ask what they are looking for that they haven’t found yet and if they would be interested in receiving more information about other homes. If they say yes, ask what stopped them from purchasing? Are you planning to sell your home first or buy first? What features, amenities, and qualities would you like to have in your new homes? Why have you decided to move? How soon are you looking to be settled in your new home? Are there other areas you are considering? What price range are you hoping to stay in? What do you like and dislike about this home? How aware are you of Howard Hanna’s unique financial programs? If you find your dream home today, are you prepare to place an offer? If not, remind them of Howard Hanna’s free pre-qualification program and encourage them to try it out. Generally a solid life tip, being honest is useful in real estate as well. Be candid and forthright about the home, explaining its features accurately. You represent yourself, your sellers, and any real estate company backing you. Be honest. People appreciate honesty and are more likely to think positively of you in the future if you are honest. The goal of an open house is to network and find potential buyers, and sometimes even potential sellers. Individual preferences and likes showcase the uniqueness of each seller, but you want your guests to be able to picture themselves living in this particular home. Studies have shown that making the space as neutral as possible pleases the majority, therefore offering a better chance for a successful open house. Have fun with your open house! Consider getting creative; set a theme or plan the open house around a big event like a sporting event. Be an excellent host, offer food, drinks, giveaways, etc. Make the most of your time with the potential buyers. Not everyone who shows up to your listing will place an offer, but you can make the open house so unique and fun that they talk about you and your creative style to people who just may be looking to buy or sell! The success of your open house doesn’t just depend on the actual event, it also depends on what you do afterward. Reconnect with those who visited your open house. Send cards or ecards thanking them for attending your open house. Ask them for feedback and answer any remaining questions they may have. Inquire as to whether they are interested in looking at other homes and if they’d like to set up an appointment to speak with you. Open2Close can be a great tool – since you have verified contact information for your attendees, use it! A personalized note, sent in addition to the automated follow up, can be a powerful way to build connections. Also relay all information back to your seller immediately after the open house, letting them know how many people came, what was said, and how much interest there was. Don’t forget to thank your seller and feel free to leave them a treat or flowers as a gift! Homebuyers: if you are out and about this spring, don’t hesitate to stop into one of our thousands of open houses at our Big Event open house weekends! Our agents would love to show you around their listings – here are some tips for how to get the most out of an open house. Share your experiences on social media using the hashtag #HHBigEvent. We look forward to seeing you! Good luck on your home buying endeavors and good luck to all of our agents with their successful open houses! Excellent information but would like to know how a small community HH agent can get included in this weekend event?